Home / Bitcoin / How to buy / Zebpay / Step by Step explanation on How to buy/sell bitcoins in India from Zebpay? How to trade with Bitcoins? How to Invest in Bitcoins? Where should I start from? Bitcoin is a digital currency which is stored electronically. To start trading/investing in Bitcoin, you first need to have a bitcoin wallet. There are many companies which provide bitcoin wallets. Zebpay is one such trusted company in India which offers a bitcoin wallet to store your cryptocurrency. So, today we will see how to buy/ sell bitcoins using Zebpay bitcoin wallet. Zebpay allows you to buy/sell bitcoins only using a mobile app. I have divided the article into 5 sections for you so that you can with ease understand the process of buying/selling bitcoins using ZebPay in India. How to create Zebpay Bitcoin Wallet Account? Enter Valid mobile number and click on “accept and continue”. You will receive an OTP(One Time Password) on your mobile. Simply enter the same OTP to verify your mobile number and then click “verify”. Now you will be asked to setup your Pin. 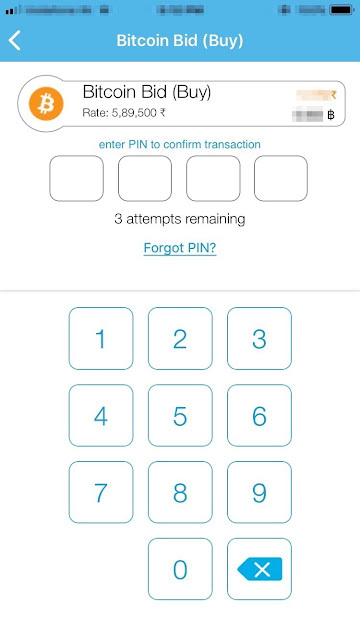 Enter the 4 digit Pin that you want to set for Zebpay wallet. Do not share your pin with anybody. As a next step, you need to verify 4 things - Email, PAN Card details, Bank details and Aadhar Card details. To verify these details, tap on menu option situated at top right corner on home page and then click on “verification”. Enter your email id and go to your mailbox. Open the mail from Zebpay, read instructions and verify your email id and then click “next”. Upload your PAN card scanned photo and mention exactly the same details as it is in PAN Card. Click “next”. Upload cancelled cheque / statement / pass-book and required bank details and click “next”. Please read instructions carefully before submitting the documents. Upload front and rear of Aadhaar card and enter required details as per your Aadhaar card and click “submit”. After submitting all required details for account verification, you will see the status as “pending”. Your account will be verified within 3 working days. On successful verification, the status shall change to 'approved'. *CAUTION: It is important to note that, if you forgot your PIN and you try wrong attempts for more than 3 times, then your account will be blocked for 36 working hours. How to add money to your Zebpay Bitcoin Wallet? Login to the Zebpay app. Go to home page and click “deposit” button. After that, read all the instructions carefully and click on “accept and continue” button thrice. 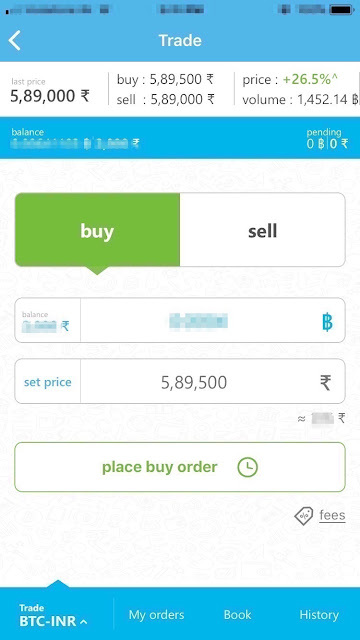 In next screen, bank details of Zebpay will be displayed. Either take a screenshot or note it down somewhere carefully as you will be transferring fund at these bank details. Click “next”. Confirm your bank account details as you will have to make payment to the Zebpay bank account mentioned in step 4 above, from your this bank account only. Tap on 'Place deposit order' to proceed. If you make payment from any of your other bank account, the amount will not be accepted and will be refunded back to you. Login to your mobile banking / net banking service. Transfer the same amount as mentioned in step 2. Kindly note that the account type of Zebpay is “current”. They haven’t mentioned it, but you will be asked for it when you add it as third party transfer. You will receive a confirmation mail when the amount is transferred. Copy your payment reference number from the account statement. 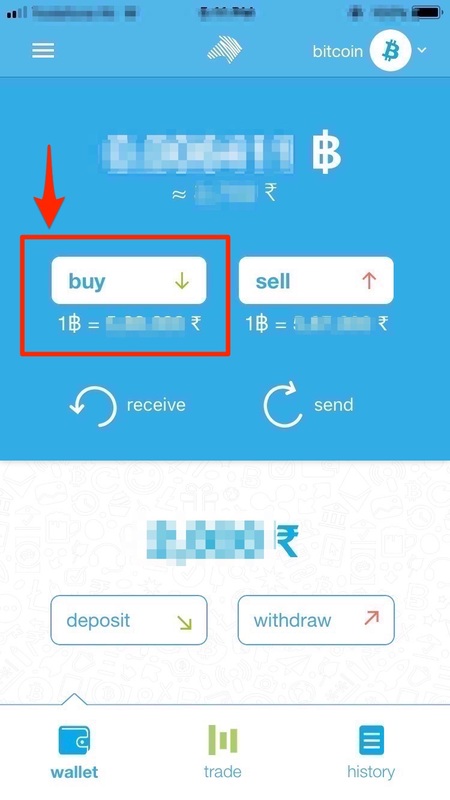 Go back to Zebpay app and paste the reference number and select transaction type as per your preference. Click “submit” button. Your amount will be reflected in your app within 2 to 24 hours, after you make payment. Contact Zebpay if your money is not reflected within 24 hours. * If you choose payment gateway as the payment mode instead of RTGS/NEFT/IMPS then you will be charged for transaction fees additionally. Though the process being simple, if possible avoid it in order to save and opt for Bank Transfer. How to buy/sell Bitcoin from Zebpay app? This section is most interesting as this will finally help you start trading/investing in Bitcoins. 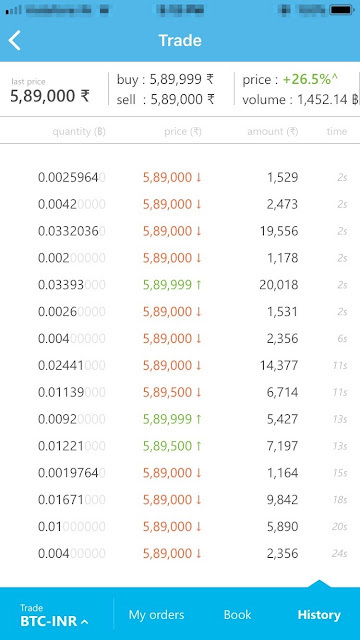 Enter the cryptocurrency amount and set price at which you want to buy bitcoin. Next, click “place buy order”. Note, the amount you enter should be less or equal to the balance in your Zebpay Wallet. Enter your 4 digit PIN to confirm your purchase. Once you enter the PIN, your bitcoin purchase is complete and you can also see your new bitcoin balance on the home screen. A receipt of the same is also send to you by email. You can see your current/pending buy orders in "My Order". Click "History" to see the history of buy and sell orders processed till date. Congrats, you have successfully purchased Bitcoins. Similarly, you can sell your bitcoins and the amount will be reflected in your Zebpay Wallet. You can transfer this amount to your bank by tapping on “withdraw” button. 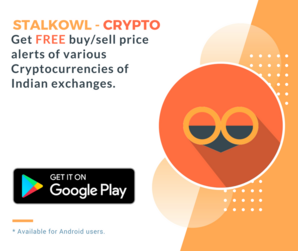 To trade smartly and track bitcoin rates, I strongly recommend StalkOwl’s Crypto. This website offers you Bitcoin Price Alerts, Price Comparison and Latest Bitcoin news. You can also check our blog on How to set Price Alerts for Bitcoins, Ethereum and Lite Coin in India Using StalkOwl. I hope this article helped you to buy/sell bitcoins from Zebpay. Share your experience on purchase of your first Bitcoin in comments. Your feedback is important to us. Trading in bitcoins and cryptocurrencies is subject to market, technical and legal risks. Prices in India vary from international prices due to local demand and supply. Zebpay does not guarantee any returns. Users use Zebpay at their own risk.